Scene-lighting (aka mood-lighting) brings a lttle bit of theatre into your home. 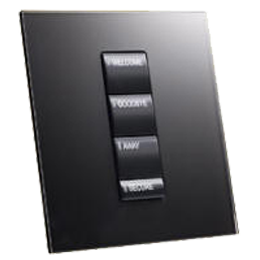 Traditional, manual lighting control has been a switch or dimmer for each ceiling or wall light with additional table lamps switched at the lamp base. Changing the lighting involves a trip to the switches by the door and a circuit of the room turning on or off the lamps. Scene-lighting puts control of all the lights under one system that you command in terms of what you want to do. "Watch TV", "Eat dinner", "Read the paper" etc. Each of these scenes combines appropriate settings for each light with smooth transitions for the scene changes. The scenes will be defined initially by your lighting designer but the can then be modified by you as your needs change. The switches and knobs by the door are replaced with a stlyish panel like the one in to photo above. For places like the living room, you also get to control the lights from the same universal remote control you use for everything else. You can have this kind of system in just one room or throughout the house. Having the whole home under control by the system brings big advantages. You can make sure all the lights are off when you leave the house or light a subtle path to the bathroom from a single button by the bed in the middle of the night. When the lighting system is integrated with a home management system you can add automation features like saving energy turning off lights in unoccupied rooms, changing scene based on the time of day or whether it's sunny or gloomy outside. Not just practical, you can do fun stuff too, like dimming the living room lights as a movie starts or creating a dynamic environment for a party. ersp-design offers a full lighting design service. We'll discuss your needs, suggest lights and controls and do a complete design whether you're just updating your living room or planning a complete new build. We specialise in energy-efficient lights. We're happy to work alongside your interior designer if you want. Next we produce clear, easy to follow installation drawings for either your electrical contactor or one of our selected partners in your area. We supervise and check the first-fit install before returning for installation of the controls and initial programming during second fit. When you are ready, we show you how to use the system and make it's working as it should. Later, normally after a few weeks, we'll make a return visit to check the system and make any adjustments you feel you need once you have got used to it.